Located right in the middle of the tourist hub of Alona Beach area of Panglao Island, we are a small, modern, green and eco-friendly hostel with only 6 rooms distributed to a maximum of 38 guests. Right outside our doors are international and local restaurants, cafes, a convenient store and gift shop, with lots of public and private transport that will take you anywhere in Bohol. The white sands of Alona Beach is an effortless, 5-minute walk. Nearby are ATM machines, money changers, bars and clubs. We may be small but we offer loads of possibilities to our guests so they can maximize their stay in our island paradise. We offer different types of activities to suit anyone's taste in terms of sightseeing and activities: from the passive types to the adventure junkie, we have something for everyone. We constantly look for ways to improve our services to satisfy our guests in the best way possible. We offer free, light breakfast, WiFi, hot showers to name a few. Die Unterkhnft ist super zentral gelegen. Direkt in der „Stadt“, mit vielen Essmöglichkeiten um die Ecke. Ein ATM befindet sich ebenso unweit der Unterkunft, der Strand ist auch nur ca. 5-10 min Fußweg entfernt. Das Personal war super nett und die Betten sauber. Kann das Hostel wirklich empfehlen. I HAD A REALLY REALLY GREAT TIME IN THIS HOSTEL!!!! i WILL COME AGAIN WHEN i HAVE A CHANCE TO GO TO BOHOL!!!! THANKS FOR EVERYTHING TO STAFF!!! AND COMFORTABLE ROOM!!!! Super hot showers with lots of pressure. Key pad on dorm doors. Good location. The AC keeps the rm cold.. would help if bed sheet was a little bigger and bit thicker. Very relaxed place loved the use of recycled items used in this hostel bed were clean and private. pretty good location along the main strip however it is about ten minutes to Alona Beach. amazing restaurant downstairs. Free breakfast was oatmeal. staff were friendly and very helpful with everything I needed. pod style beds were good but the mattress was uncomfortable as it sagged in the middle, not good for the back. there were opportunities to meet people but when I was there mostly people kept to themselves. great location. I thought it was a great hostel! Moon Fools Hostel has unfortunately left a sour taste after our stay. Even though the location is good the rest lacked in everything. The rooms are small and do not look like the photo’s. Even though the staff was friendly we did have an issue with our private tour that we had booked. Trying to discuss the matter was near impossible as the girl did not inderstand and the manager was not there. After a few emails we still have not heard back from them. In the end it is not worth the money. 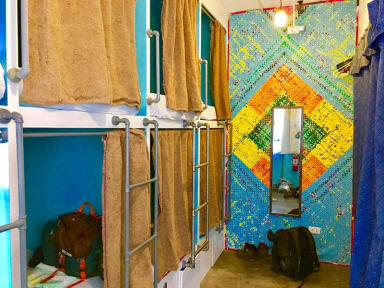 Very dirty hostel. Bed bugs - many! So big & they crawled up the walls around the beds, my girlfriend had huge bites on her arms after one night. The staff weren’t surprised or worried. They offered to move us to a new dorm and vacuum the bed (neither of these things solve the problem). We explained that they need to chemically treat it but they didn’t. Other - MUSHROOMS GROWING IN SHOWERS! mould in kitchen, bathroom never cleaned.